Hi. Seeing that the classic geocaching app is being sicobtinued it appears that I won't be able to cackle until I find an app that shows the caches on footpaths as my caving is always done out in the countryside. Can anyone recommend a good simple app for iPhone ? Well, I noticed when I was looking yesterday that cachly claims that it includes OS maps. I've not used it so I don't know if it means "proper" 1:50/25,000 OS maps or just the street map sort of maps, but it might be worth a look - and if it does can you let me know! 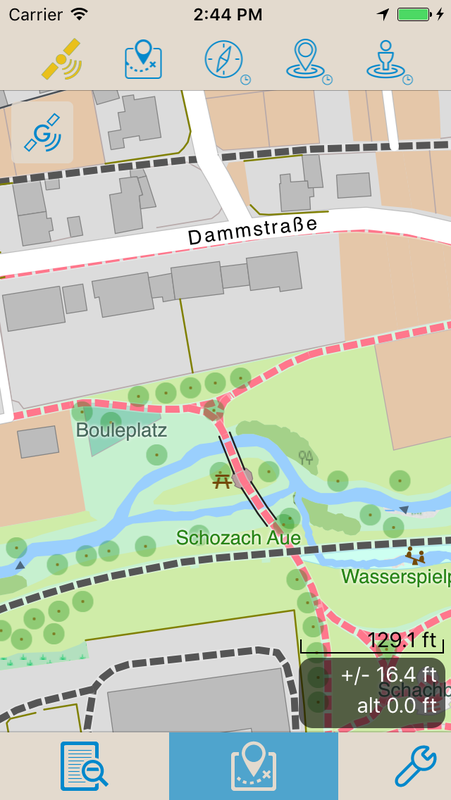 I don't know about others but Cachly provides OSM (Open Street Maps) maps which provide trail/footpath info. Here's a screenshot that happens to be an offline downloaded mapset but the same display would show for an online map display. Cachly allows downloading of area/region/country OSM maps to support offline use or use where you don't want to use cellular data. In my screenshot you can see some trails in the center and some dotted footpaths in a smaller park on the right side of the screenshot. 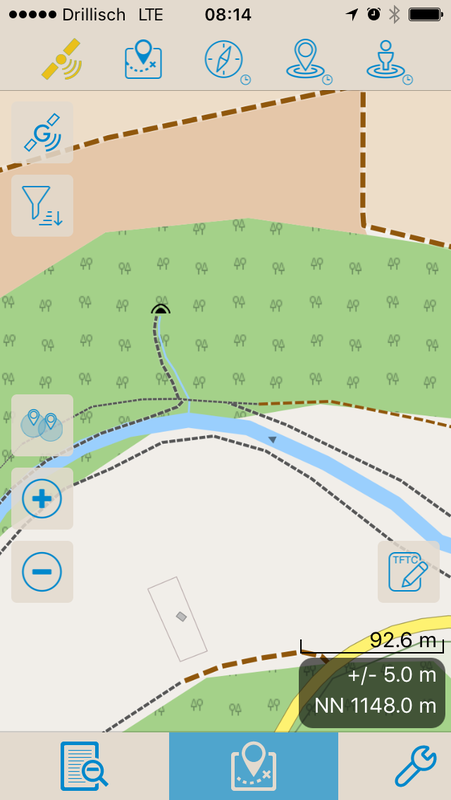 It also supports many other online maps but since you asked specifically about footpaths, I know that OSM is a strong option which is supported in both online and offline modes. I highly recommend Cachly! Looking4Cache Pro have very detailed offline vector maps. They include footpaths, bicycle way and farm tacks. All this smaller ways are painted dotted. Also it include nodes like trees and branches in the next version. I use Geosphere, which has online maps internally that can be "cached" but allows me to "bookmark" (link to) most online or offline mapping apps directly from the cache page - opening the apps and sending coordinates to them. In this respect, Geosphere acts as a hub that takes advantage of the strengths of other apps as well as its own features. For trails, the open source maps show as good of information as I have found. Pocket Earth is my favorite - the vector maps are very quick to download and there are options for gpx import, topo lines and routing. In addition to linking up individual caches, I have created gpx files in Geosphere and exported them to Picket Earth. OsmAnd has nice looking maps with hillside shading - but the app is not as robust on iOS as it is on Android and linking to it is problematic at the moment. GaiaGPS has several maps and gpx import, although the download is more cumbersome for large areas. For voice routing while driving, I link to other apps. I have tried offline maps with GeoBucket, Cachly, and looking4cache. For various reasons I do not use these apps for caching. Geosphere is very powerful, with features most other apps do not have - particularly for importing, exporting, filtering, merging, creating and editing cache data on the fly - a mini GSAK. Some of its options, like customizing the display (earthcache pins should be brown) or internally ignoring caches, end up being important to me. The transition from online to offline caching is very seamless. It was originally an offline app (before the API was added) and that strength still shows. There have been times when I have been hiking out of cell reception with friends and Geosphere was the only app any of us had that had automatically downloaded cache page graphics that we needed. The caveat with Geosphere is that the developer is overdue with an update (although he has stated that it is in the works and there is a "language fix" within the app that corrects some problems that first popped up with iOS 9). If it ever becomes inoperable I would put Cachly back on my iPhone - although I would miss many of Geosphere's features and would probably switch to Android for most purposes relating to this game. In general, however, the third party apps using the API have more capability than Groundspeak's classic or current apps so any of these apps would get you where you want to go. After that it is a matter of specific features, design, and personal preferences. I use Geosphere, which uses online maps internally but allows me to link to most offline mapping apps directly from the cache page. Not to the original poster... Though Geosphere still mostly works, it was last updated quite a while ago and the application is based on some legacy application technology. This legacy technology will no longer be supported in the next release of the iOS operating system. I would not move to Geosphere unless the developer updates the application, which was last updated Nov 2013.